Kung Hei Fat Choy! 恭禧发财! 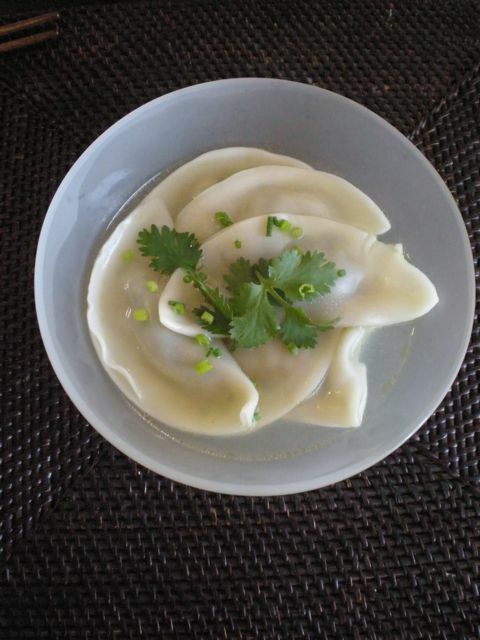 In China, jaozi (dumplings) are prepared to celebrate the new year. Shaped like ancient Chinese coins, some families cook them on New Years' Eve at midnight to symbolize bringing prosperity and luck into the new year. Everyone has their own secret recipe (thank you Rowena for sharing some tips), traditionally, they are filled with ground pork and leafy vegetables, but the possibilities are endless, shrimp, mushrooms, tofu... Versatile also in cooking methods, they can be boiled, steamed or fried. 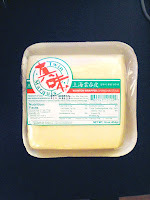 A stash of uncooked dumplings can be kept in the freezer for easy food, at any time. Rinse the leaves well, and drain. Then stack the leaves into piles, or a large bundle to cut them into fine shreds. Turn the cutting board 90° to cut these leafy shreds into small pieces. In a large bowl, combine one teaspoon of the salt with the leaves, tossing to coat. Transfer into a sieve. Let rest for 30 minutes. In the meantime, in another bowl, combine the pork, the remaining ½ teaspoon of salt, green onion, tamari, sesame oil, mirin and ginger (if using). Stir until the pork has a "sticky" consistency. Set aside. After the half hour, rinse, and squeeze as much water out of the leaves as possible. Incorporate into the seasoned pork mix. Have a seat and a clean, dry "work" space. Place one wrapper in the palm of your hand. Spoon one scant tablespoon of the filling into the center of the wrapper. Dip your fingertip into a small dish of water and “paint” along the entire perimeter of the wrapper. FOLDING CIRCULAR WRAPPERS: Fold the in half, into a semi-circle pinching the edges together to seal. As you are pinching, from “corner” (where the fold is) to the other, fold and press in a few pleats / ruffles. The pleats are not necessary, but it helps keep the meat from shifting around when boiling. The important thing here is to have a good seal so that nothing falls out when cooking. FOLDING SQUARE WRAPPERS: Fold all two opposite corners in towards each other and pinching to seal just the corner to form a loose triangle. Then take the two remaining corners and pinch all four corners together to form a pyramid-like parcel. Then pinch the rest of seams together to seal, from the top, it looks like a “X”. You will get better at this with practice, then you can start incorporating the pleats. Place onto a baking tray, lined with wax paper. Make sure they are spaced slightly apart from one another, and in a single layer, to prevent them from sticking to each other. Loosely cover the assembled dumplings with cling film to prevent them from drying out. Continue until you run out of wrappers or filling. At this point, you can place the tray into the freezer. 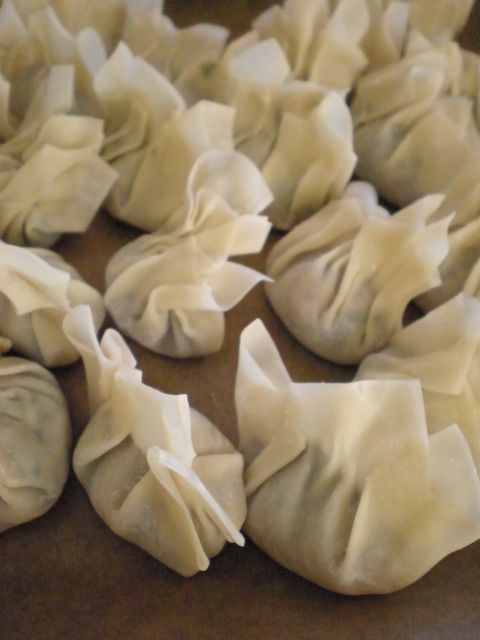 After 2-3 hours, when the dumplings have frozen, place them into a freezer bag and freeze for future use. BOILING: Cover and bring a large pot of water to a boil. Stir the water with a wooden spoon while you are placing the dumplings (fresh or frozen) in, a few at a time, keep stirring to prevent them from sticking to the bottom. Do not overcrowd the pot. Bring to a boil again and cook for a further 10-12 minutes. Serve in bowls with a tiny bit of the cooking liquid to keep the dumplings from sticking together and drying out. STEAMING: In a deep pan, with a steamer (I use my metal basket steamer, sprayed with oil), fill pan with, about 1/2" - 1". It's important to make sure the dumplings do not touch the water. Either use vegetable oil spray or dip the bottom of each dumpling in vegetable oil to prevent sticking to the steamer and to each other. 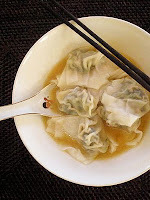 The dumplings expand slightly while steaming, so make sure they are spaced apart from each other by a half-inch (1 cm) or so. When water boils, cover and steam for 12-15 minutes. Make sure to keep an eye on this, to make sure the water does not evaporate completely. If using the traditional bamboo steamer baskets, stack them on top of one another and rotate from top to bottom halfway through, to ensure even heat distribution. PAN-FRY: Heat a large frying pan. When hot, add 1 Tbsp of high-heat oil (sunflower or coconut oil) swirling the pan around to coat the entire surface. 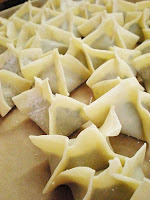 Add the dumplings, in a single layer, so they are not touching. Gently shake the pan to ensure that they do not stick. Turn the heat down low and cover, you will be letting them sit for a long time so that the filling gets cooked, and the wrapper gets lightly toasted, not burnt, so check that the heat is not too high. Let it gently toast for 7-8 minutes. Turn the dumplings over, shake to loosen from the bottom, and cover again. Cook for a further 7-8 minutes. Yum! This is fun to eat and fun to make. The kids had a great time shaping the squares into parcels. I wish I had remembered to put a peanut inside 1... that would have completed the fun and added to the Chinese New Year celebration! Traditionally, it is a gold coin, not a peanut, that is put into one of the dumplings for "extra" good luck. But that a bit on the dangerous side!